When handsome rake Freddy Monkton-Coombes finds himself about to be trapped in an untenable situation by his match-making parents, he pays Damaris to enter into a faux betrothal. But then an accident throws them into a compromising situation, and they’re both forced to reevaluate their position. 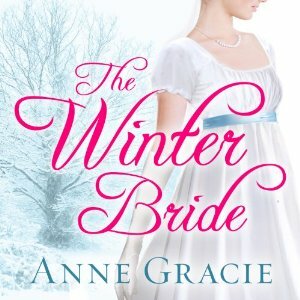 What a marvellous, heartfelt, laugh-out-loud read The Winter Bride by Anne Gracie is! Right from the start of the journey of Freddy and Damaris’– attraction was just so well written and so many laughable, memorable moments and with additional characters made the story even more of a super read. Their constant repartee was brilliant and often hilarious in spots and the deeper emotional parts of the book, well let me just say, have a box of tissues at hand. A lot of deep sentiments in this book –friendship, laughter, love, loss, grieving, trauma and healing. A truly magnificent read! 5 Stars! 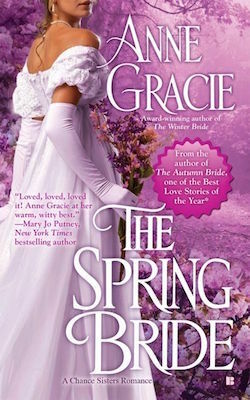 Gracie continues the charming seasonal saga of the four Chance sisters (introduced in The Autumn Bride), family by choice rather than blood, with this thoughtful and tender Regency. 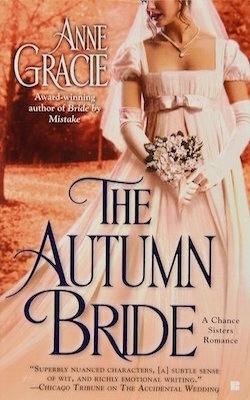 Miss Damaris Chance (formerly Tait), a missionary’s daughter, has a well-earned “abhorrence of marriage.” The Honorable Frederick Monkton-Coombes wants to present a fiancée to his cold and distant parents to avoid their matchmaking schemes. Freddy and Damaris enter into a business arrangement: she will engage in a faux betrothal in exchange for ownership of a cottage that will allow her to be self-sufficient. Freddy’s cultivation of his rakish reputation has developed his wooing skills, which are put to the test when his friendship with Damaris evolves slowly into romance, despite both parties’ hurts and vulnerabilities. Gracie gradually expands the setting without overwhelming the reader by sending Damaris and Freddy to his family estate, separating them from Damaris’s benefactor and Freddy’s business partners, while setting the scene for the next two seasons. Neither Freddy Monkton-Coombes nor Damaris Chance is interested in marriage, so Freddy convinces Damaris to enter into a fake engagement to get his mother and a horde of marriageable young ladies off his scent. What could possibly go wrong? It’s 1816, and Damaris has a new lease on life. Leaving her past behind, she’s landed on her feet, living in the home of her informally adopted aunt, the aristocratic Lady Beatrice, along with her sisters-of-the-heart, collectively known as the Chance sisters. But she knows marriage isn’t in her future, thanks to some horrible luck and a blackguard sea captain. Determined to make enough money to buy a small cottage and live on her own terms, she’s quietly taken a job painting pottery. But somehow Freddy has learned her secret, and he’s not pleased, since it involves wandering through less-than-safe neighborhoods at ungodly hours of the morning, and he’s promised his dear friend Max—Lady Bea’s nephew, now married and honeymooning with the eldest Chance sister—that he would keep an eye on the household. After Damaris and Freddy share a frank conversation regarding their shared antipathy toward marriage, Freddy asks her to play the role of his fiancee, since his mother is putting pressure on him to pick a bride. In return, Freddy promises her the cottage she’s always wanted. But as they spend time together, they learn each other’s deepest secrets and most ardent desires, and suddenly marriage doesn’t seem quite so atrocious. 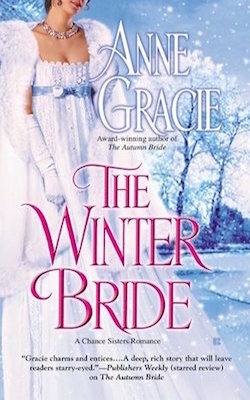 Gracie continues her Chance Sisters series with another delightful, emotionally complex romance. Freddy and Damaris are each textured characters, combining well-hidden wounds with a determination to thrive in spite of them, which makes them perfect for each other once they break through to trust and understanding. 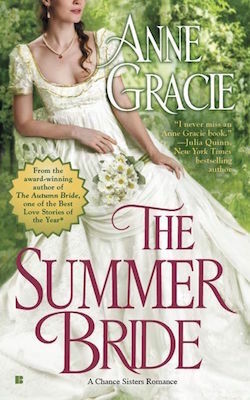 A romantic winner, with Gracie’s typical witty charm and sweeping emotion.